Ladies and gentlemen, Mr. Robert…De Niro! Yes. The one and the only Robert…De Niro!! Robert, and you know what comes next, my friends…De Niro!! We have Robert, then now the burning question is, of course, “De Niro? The man of hair and photographs?” Yes, De Niro! First name Robert! And as for the last name…De Niro!! Folks, the man you’re about to see is a treasure. He’s worked in Hollywood since way back in the ’70s and ’80s with Taxi Driver, The Godfather series, Raging Bull—there are too many memories to count, and he’s still at it today. 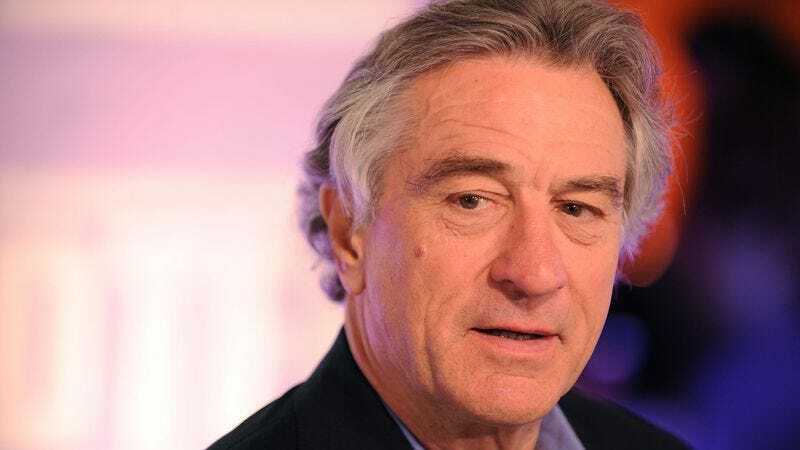 You can catch him in the hilarious comedy The Intern this month, we all love him to death, it’s Robert—and don’t you dare call him Bobby, because Robert De Niro is the name he prefers—De Niro!!!!!! Give it up one more time for Robert…yes, ladies and gentlemen, De Niro!! Robert De Niro, everyone. Give him a hand.